With spring training games just eleven days away, opening day of the regular season will be here in the blink of an eye. When camp starts, there will be approximately sixty players vying for 25 spots on the Yankees major league roster. While some of them are extreme longshots and others are merely prospects garnering some experience, there will be a plethora of competition in Yankees camp this spring. Despite the roster not lacking superstars and veterans, there are holes in the roster that need to be filled. In this article, I will predict who will be in the dugout on opening day alongside Aaron Boone and his new coaching staff. These players will without a doubt be on the Yankees come opening day barring a major injury or catastrophe. This player, aka Jacoby Ellsbury, will in all likelihood be on the opening day roster despite being the fifth best outfielder in camp. Unless the Yankees make a surprising move and find a trade partner by April, Ellsbury will be a Yankee. With 18 spots filled by locks and a massive contract that leaves eight spots left for the squad. The Yankees still need a backup catcher, utility infielder, starting second and third baseman, another backup position player, one more starting pitcher, and one more reliever. 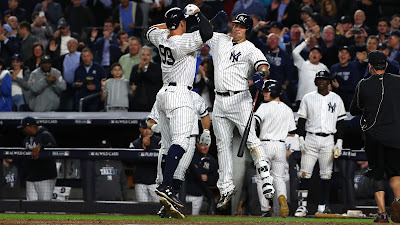 Austin Romine will likely remain the backup catcher unless Kyle Higashioka or Erik Kratz absolutely rake in spring training and impress manager Aaron Boone. I will stick with Romine. Unless the Yankees sign another starting pitcher, Jordan Montgomery appears to be the front-runner for the fifth starting spot. Chad Green is rumored to be heading into spring training as a starter, but Montgomery displayed nothing but poise and control on the mound as a rookie in 2017. He plans on developing his changeup more this spring. Ronald Torreyes will be a part of the Yankees’ infield to some degree whether it is as starter or the utility-man. I believe Tyler Wade and Miguel Andujar crack the roster as the opening day second and third baseman respectively. Wade’s versatility makes him a valuable player, and he and Toe can be interchangeable pieces at the position. Gleyber Torres could snag one of these spots if he steals the show in spring training, but after missing almost all of 2017 with Tommy John Surgery and considering the factor of team control, I believe the team will start him in Triple-A. For the last position player spot, the Yankees need someone who could spell Greg Bird or be a solid pinch-hitter off the bench. This is why I believe Tyler Austin should earn the last spot. The final spot on the roster is in the bullpen. The Yankees bullpen is stacked, but there will be a single opening come spring training. Candidates vying for the spot include: Chasen Shreve, Ben Heller, Wade LeBlanc, Luis Cessa, Giovanny Gallegos, Jonathan Holder, and Domingo German. Ideally the Yankees would want a swingman in this role such as German or Cessa, but with Adam Warren and Chad Green able to go multiple innings, it is not really necessary. Due to this, the Yankees should give the opportunity to Ben Heller. Heller was lights out in Triple-A last season and had a huge outing in September for the Bombers. I believe it will boil down to Heller or Shreve, and Shreve could steal the spot if the Yankees opt for another southpaw. Clint Frazier and Gleyber Torres are controversial misses, but due to the outfield logjam and Torres’s situation, I believe they are both Scranton bound. Without the binder in the Bronx, the philosophy may change. The Yankees have such solid bullpen pieces that the matchups aren't too necessary. I would take Chad Green or Tommy Kahnle versus a left slugger over Chasen Shreve or Wade LeBlanc. You forgot Austin Romine in your final prediction.